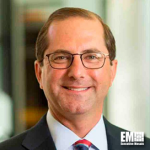 President Donald Trump will nominate Alex Azar, chairman and founder of consulting firm Seraphim Strategies, to lead the Department of Health and Human Services. Azar previously served as president of Lilly USA, an affiliate of biopharmaceutical company Eli Lilly and Company, where he oversaw the U.S. biomedicines business unit, the White House said Monday. The HHS secretary nominee worked at the department during the administration of George W. Bush as deputy secretary and as general counsel. Azar also served as a partner at Washington, D.C.-based law firm Wiley Rein and as a law clerk under Antonin Gregory, former associate justice of the Supreme Court.